Category Archive for ‘fans’ « .Evolving Music.
. Closed Tags: condom, cusom app, custom condoms, Droid App, iPhone app, mixmatchmusic, MobBase, mobile app, sonic promos, web app. We think you should get in your fans’ pants. Thanks to our friends at Sonic Promos you can do just that, safely. Although if you’re looking to get into your fans’ pants through their phone, learn how to make iPhone apps at MobBase.com!
. Closed Tags: At The Bottom, Bay Area, Brand New, Chico, concert, Daisy, Deja Entendu, fans, Jesse Lacey, Jesus Christ, Jude Law and a Semester Abroad, love, Regency Grand Ballroom, Robbers, Sainthood Reps, San Francisco, September, Seventy Times Seven, Soco Amaretto Lime, Sowing Season (Yeah), The Boy Who Blocked His Own Shot, The Devil and God Are Raging Inside Me, Vices, Your Favorite Weapon. On September 10th I went and saw Brand New perform at the Regency Grand Ballroom in San Francisco. This was an evening of firsts – it was the first time Brand New had been in San Francisco since 2009, the first time they had toured in a year, and my first time seeing them live. Walking into the room, we all knew we were there for the same reason – the music we loved and an experience we would never forget. Each fan expected something different – for those seeing the band for the first time, they had no idea what to expect but knew it would be something they would remember; for those seeing Brand New for their fourth or fifth time, they knew the energy the band would bring but waited in anticipation for the songs the band would showcase. Everyone went straight to the front of the ballroom as soon as the doors opened, squishing up towards the barricade as close as they could in hopes that they would be able to catch something at the end of the show. The show began and Robbers stepped onto the stage. They brought an easy indie vibe to the crowd that encouraged some bobbing heads and slow movement. After they closed their set, Sainthood Reps took the stage and brought a faster alternative vibe to the crowd causing them to jump and begin to push up closer to the stage. As I listened to both of these bands for the first time, I could tell that they were inspired by Brand New in some sort of way and pulled two different aspects from their music. Robbers was pulling from their slower, more melodic songs like “Jesus Christ” and “The Boy Who Blocked His Own Shot.” Sainthood Reps were getting their inspiration from songs like “Seventy Times Seven” and “Vices.” With both of these bands opening, they exposed the audience to different musical aspects that Brand New would tie together as soon as they took the stage. It was at 10 o’clock that Brand New finally ascended the stage, opening with “Sowing Season (Yeah).” The crowd surged and went insane as soon as the first “Yeah!” was sung; while there was no mosh pit, the amount of movement occurring throughout the crowd never stopped. Halfway through their set they played “Jude Law and a Semester Abroad“, off of their first album Your Favorite Weapon, followed by “Seventy Time Seven”, a fan-favorite and my favorite song by them. The crowd went supremely crazy during these two songs because they are very fast paced and come from their early days. Brand New continued to intertwine songs from different albums and made their encore “At the Bottom,” “Jesus Christ”, and “Soco Amaretto Lime. The last song was played just by Jesse Lacey, the lead singer, as the rest of the band members walked off stage. All the fans were singing and many had tears in their eyes due to the lyrics that Jesse changed from “you’re just jealous cause we’re young and in love,” to “I’m just jealous cause you’re young and in love.” The tears also stemmed from not knowing when Brand New would be back and playing shows, or when they would release their next album. This was one of the best concerts I have ever been to hands down. While Brand New did not talk a lot in between their songs, make jokes with the crowd or involve them too much with the live show, they delivered a set list and performance that they knew their fans wanted to see. The unique thing about Brand New fans is that they don’t just know “the popular songs” or the newest album, but they love each album and know the majority or all of the songs they played. Simply put, they’re dedicated – I met people who had seen them the night before in Chico and drove down to San Francisco to see them again, and one person who drove sixteen hours to see the band. This made for the entire crowd singing each song, sometimes even louder than the microphone was. While no one knows when the next Brand New album will come out, or how much longer they will be around, the performances they give are not going downhill or lacking in any aspect. The next time they come around I know I will be there no matter how much tickets are or how far I have to drive.
. 1 Comment Tags: Block After Block, concerts, Daylight, Fox Theater, Matt and Kim, Matt and Kim at the Fox Theater, Matt and Kim Concert Review, Sidewalks, The Thermals. This past Saturday night, I went and watched Matt & Kim perform at the Fox Theater in Oakland, California. While being a band with only a keyboardist and drummer, they are known for their upbeat music and energetic crowds. I walked into the show with high expectations, as it was my second time seeing them (I had seen their amazing performance at Live 105‘s BFD in 2010), and I expected this show to be better than the last because it was not in an outdoor venue with a short amount of time to play. Simply put, they delivered one of the most energetic performances I have ever seen and exceeded the expectations I had. As the lights went down, after The Thermals delivered a fantastic opening, I could feel the energy radiating from the crowd. The keyboard and drums were set up on a small raised platform on the stage, illuminated by the stage lights. 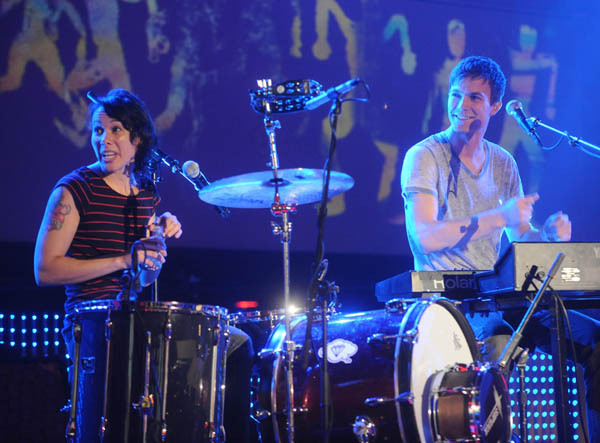 Matt and Kim ascended the stage and took their places, Kim at the drums and Matt at the keys, and dove into “Block After Block”, their newest single off their album Sidewalks. This immediately pumped up the crowd and got everyone jumping, pushing, and singing every word at the top of their lungs. As soon as the song started, the balloons went flying around and the crowd was going crazy – the balloons continued to get tossed around throughout the rest of their set and I never saw one touch the ground. Their crowd interaction did not end there, as Kim would look at people in the audience and point or smile at them – I was lucky enough to get about a minute of her eye-contact and it genuinely made the show better. She would also step away from her drums and run out to the crowd and grab the hands of fans and even hand out her drumsticks. Matt would do the same when he could and would reach out to the crowd and encourage them to sing the words instead of him. The entire show was filled with amazing energy from the both of them – the jumping never stopped and the singing continued long after the show within my ears. They ended their set with their most popular song “Daylight”, and when the crowd commanded them to perform an encore, they did something I had never seen before. Instead of just performing another song, they did a mash-up of all the hooks within all of their songs including: “Daylight,” “Cameras”, “Yea Yeah”, and “Lightspeed”. Matt and Kim completely blew me away. Instead of being the same band I saw with the same great live performance, they got better. They reminisced on their last time in the Bay Area (at BFD), where Kim did her infamous “booty dance” for the first time, and after announcing this, she recreated it for us. They also reflected back on their first show in Oakland, where they played to a cafe filled with six people, and the show got shut down because they were not the “acoustic” band that the manager had thought. While being just two people, Matt and Kim deliver one of the most energetic and genuinely fun performances I have ever seen. With the show that I experienced on Saturday night, I know that Matt and Kim love what they do and could tell that they see themselves performing and creating music for a very long time.